L’Office des personnes handicapées du Québec is a government agency that helps increase the social participation of people with disabilities. Providing direct services to people with disabilities, their families and loved ones. This page contains English translations of documents produced by the Office. The original versions in French are found on the website’s search tool. The Act to secure handicapped persons in the exercise of their rights was passed into law in 1978. Further to an in-depth review by the National Assembly in 2004, it is now entitled Act to secure handicapped persons in the exercise of their rights with a view to achieving social, school and workplace integration. It ascribes greater importance to making all public and private players more accountable regarding the challenge of the social participation of people with disabilities. 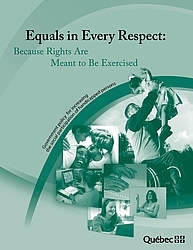 On June 4, 2009, the Government of Québec adopted the policy entitled Equals in Every Respect: Because Rights Are Meant to Be Exercised. The aim is to increase the social participation of people with disabilities over a ten-year span. The purpose of the policy is to achieve 13 outcomes related to significant improvement of the living conditions of people with disabilities, to a full response to their needs, and to parity with other citizens in exercising social roles. In order to attain these outcomes, the policy identifies three challenges to address, 11 action priorities and 41 agents of change. 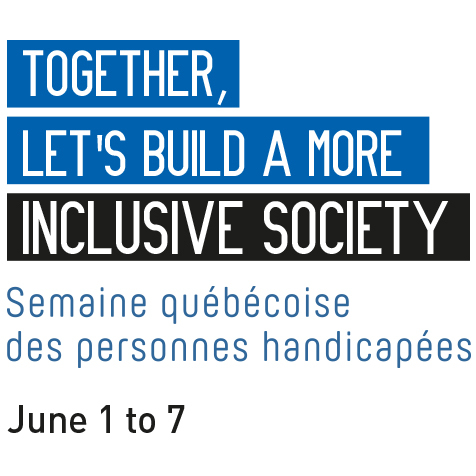 The goal of the three challenges is to make Québec a more inclusive, unified and fair society, as well as one that respects the choices and needs of people with disabilities and of their families. Summary: The purpose of this guide is to facilitate access to information about the programs offered to people with disabilities, their families and their caregivers. 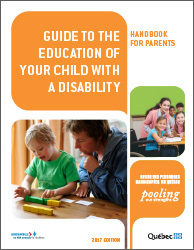 The guide was designed to inform parents, support them in their process of considering available education options for their child, and guide them in their actions regarding the educational pathway of their child with a disability of preschool, elementary or secondary school age, whether he or she is in a regular class, a special class or a specialized school. The guide provides information about the school community and actions to be undertaken regarding the education of a child with a disability. It presents the choices and possibilities available to parents, describes the steps to take, and prepares them for the role they will have to play. It also proposes resources and references that could prove useful to them in the process they are undertaking. 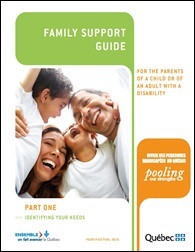 Summary: This two-part guide is intended to support the parents of a young or adult child with a disability. Part one helps identify needs in some specific dimensions of family support, thus making the steps towards meeting those needs easier. Part two offers a regional perspective on additional services likely to meet identified needs along with names and contact information of organizations offering them. This second part is available in French only. This update of the guide is in line with the Office’s 2014-2019 Strategic Plan objective of “improving access to information on programs and services available to persons with disabilities and their families”. 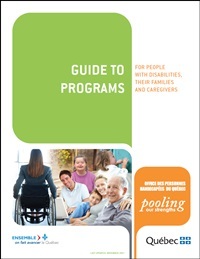 Summary: This guide aims to facilitate access to information about the programs offered to people with disabilities, their families and their caregivers. Among other things, it presents programs related to income support, home support, housing, employment, technical aids, childcare, education, transportation, recreation, sports, culture and community life. It also describes Québec’s main compensation programs that may apply to people with disabilities. Furthermore, for the first time, this new edition includes the elements concerning non-beneficiary First Nations in Québec for each of the programs. The factsheet on each program contains a description of the program, the main eligibility requirements, and the application procedure, as well as useful links for additional information. Summary: This leaflet contains useful information about the direct public services offered by the Office as well as about the various guides it has produced to support people with disabilities, their families and their caregivers. Promotional material for the 2017 edition of the Semaine québécoise des personnes handicapées. Leaflet representing Adayel who has a severe motor impairment. On this leaflet we see Adayel in a situation of social participation. Because his childcare centre made some adaptations, Adayel, who has a severe motor impairment, is learning while playing with children his own age. Adayel discovers reading. Because his childcare centre made some adaptations, Adayel, who has a severe motor impairment, is learning while playing with children his own age. Together, let's build a more inclusive society. June 1 to 7. Semaine québécoise des personnes handicapées. Logo at the bottom of the poster : Québec drapeau. Lise takes to the stage. Because the municipal community centre offers adapted cultural activities, Lise, who has a severe language disorder, can express herself through the theatre. Things that make a big difference. No matter your role in society, you can do something to increase the social participation of people with disabilities. That way, you’ll help make our society richer and more inclusive. Do you work in a childcare centre? Plan inclusive activities that enable all children to play together at the same time. Introduce activities to raise awareness. This can be done by reading or telling stories in order to talk about differences with the children. Do you introduce children to sports or cultural activities? Make young people with disabilities a part of your group and give them the opportunity to develop their potential to the best of their ability. Take your cue from the achievements of À part entire award winners (www.ophq.gouv.qc.ca/prixape). Do you manage a library? Think about making it easier for people with disabilities to access your services. Install push buttons so that doors open automatically. Consider training your staff who work at the counter to interact with people with different kinds of disabilities. Arrange the reading corner so that people in wheelchairs can use it. activities. 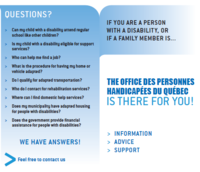 Use our awareness tools at www.ophq.gouv.qc.ca/reussiteeducative to help children with disabilities succeed in school. 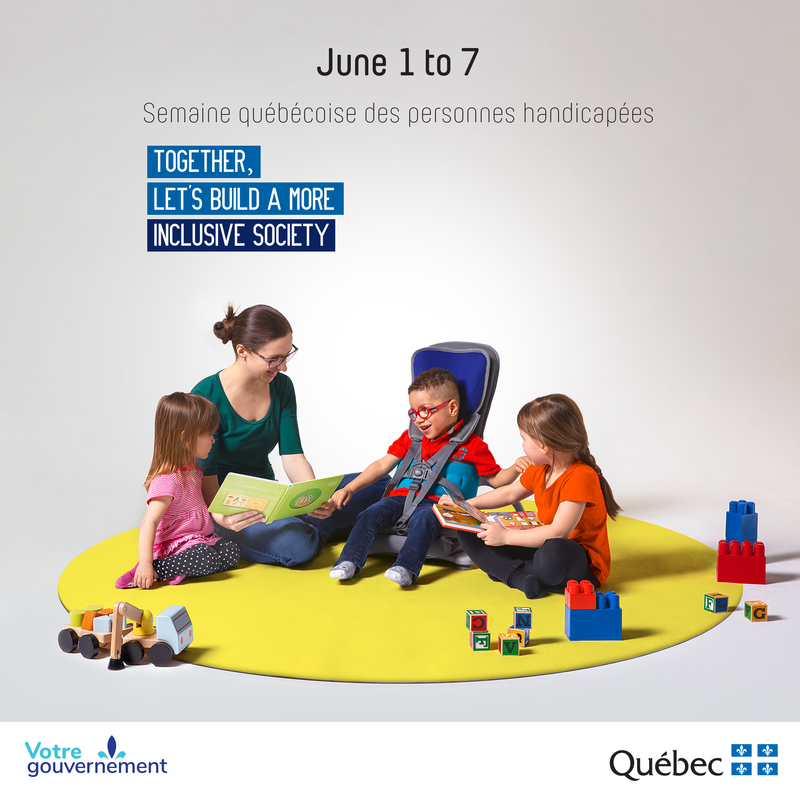 Semaine québécoise des personnes handicapées: www.ophq.gouv.qc.ca/sqph , Facebook "F" logo. OPHQ Logo. This document is available in alternate formats upon request. Poster representing Lise who has a severe language disorder. On this leaflet we see Lise in a situation of social participation. Because the municipal community centre offers adapted cultural activities, Lise can express herself through the theatre. Together, let's build a more inclusive society. June 1 to 7. Semaine québécoise des personnes handicapées. 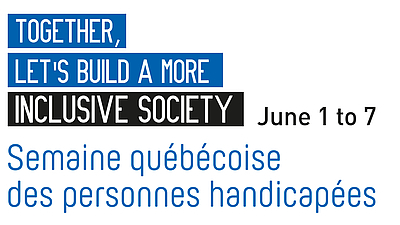 Logos at the bottom of the poster : Ensemble, on fait avancer le Québec; Office des personnes handicapées du Québec. Are you speaking with someone who has trouble expressing himself or herself? Take the time to listen without interrupting. If necessary, ask the person to repeat. Don’t pretend to understand. Repeat what the person said to make sure you understood. Are you drafting information for public consumption? Make sure to keep it simple and easy to understand. Adapt the material as needed. As much as possible, use everyday words and short sentences. See the Guide de rédaction pour une information accessible for help. Are you the manager of a community centre? Think about making it easier for people with disabilities to access your services and facilities. Consider training your staff to interact with people with different kinds of disabilities and adapt your meeting spaces. Are you part of a sports, cultural or recreational organization? Take measures for people with disabilities to be part of your group and make it possible for them to develop their potential to the best of their ability. Take your cue from the Lakeshore Soccer Club and Corpuscule Danse, winners of the Prix À part award! 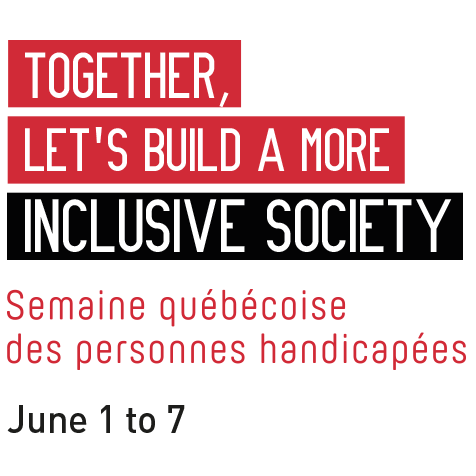 Semaine québécoise des personnes handicapées: www.ophq.gouv.qc.ca/sqph, Facebook "F" logo. Proud partner: Hydro-Québec logo. This document is available in alternate formats upon request. Leaflet representing Agathe who has an intellectual disability. On this poster we see Agathe in a situation of social participation. While she writes on the blackboard we can see the reflection of her face in a mirror. Agathe is breaking down prejudices. Because she was integrated in a regular class with the proper support, Agathe, who has an intellectual disability, is now building tomorrow’s inclusive society along with her neighbourhood friends. Together, let's build a more inclusive society. Semaine québécoise des personnes handicapées. June 1 to 7. Logos: Ensemble, on fait avancer le Québec; Office des personnes handicapées du Québec. Little things, big results. No matter what your role in society, you can do little things to increase the social participation of people with disabilities. That way, you can help make our society a richer, more inclusive one. You are a teacher? Encourage your students to be open-minded and respectful of their peers with disabilities. You are a school principal? Ask your school team to mark the Semaine québécoise des personnes handicapées by holding awareness-raising events. You are the parent of a student? Have an open discussion with your child to encourage a positive and respectful attitude towards people with disabilities. You attend school? Inform an adult figure at school if you witness any bullying against a schoolmate with a disability. You attend school? Team up with a classmate with a disability to work on an assignment or project. You attend school? Invite a classmate with a disability to share some time with you and your friends during the morning or afternoon breaks. Leaflet representing Fabien who has a motor disability. The leaflet shows Fabien in a social participation situation. He is sitting on a regular chair in front of his computer while his reflection on the floor represents a person in a wheel chair. Fabien will provide entertainment for the young and young at heart. Because the classroom is wheelchair accessible, Fabien, a soon-to-be graduate in 3D design, will join a qualified workforce in a forward-looking sector. Together, let's build a more inclusive society. Semaine québécoise des personnes handicapées. June 1 to 7. 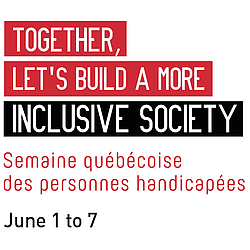 Logos: Ensemble, on agit pour une société juste et équitable; Office des personnes handicapées du Québec. You own a house, a condo or a building? Make sure the sidewalk in front of your property is free of obstacles. You are an architect or a building contractor? Get to learn more about the universal accessibility of buildings and make the appropriate suggestions to your clients. You ride a bicycle? Be open-minded and respectful of people using a motorized mobility aid (power chairs and mobility scooters). You notice the presence of children with disabilities in your neighbourhood? Inform your municipality of the need for adapted playground modules so all children can have access to them. Leaflet representing Julie who has a severe mental illness. The poster shows Julie in a social participation situation. She is standing in front of her work. Julie brightens people’s lives. Because her employer sees her strengths and knows how to make the most of them, Julie, who has a serious mental illness, blooms as a florist. Together, let's build a more inclusive society. Semaine québécoise des personnes handicapées. June 1 to 7. Logos: Ensemble, on fait avancer le Québec; Office des personnes handicapées du Québec. You are a student? Invite a classmate who has a disability to share some time with you during the morning or afternoon breaks. You are a parent? Suggest that your child invite a classmate with a disability to your home to play. You work in a daycare centre? Be positive about the addition of children with disabilities to your group and the planning of inclusive activities allowing them to participate. You are a municipality employee? When putting together any project (intersection, playground, festivities, community centre, recreational activities, etc. ), think inclusive: will people with disabilities be able to participate like everyone else? Leaflet representing Laurence who has a hearing disability. The poster shows Laurence in a social participation situation. She is shown sitting down while tying her soccer shoes. Her shadow on the floor represents the hearing disability logo. For the team, Laurence counts. Because her coaches never shied away from adapting their practices and her teammates learned how to communicate with her, Laurence, who has a hearing disability, became a key player. 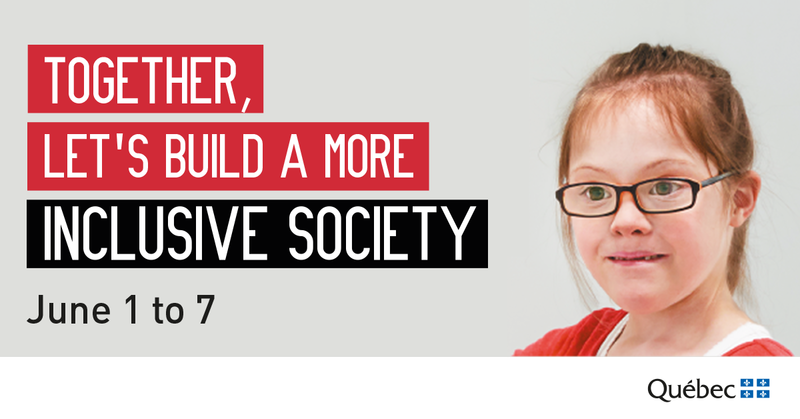 Together, let's build a more inclusive society. Semaine québécoise des personnes handicapées. June 1 to 7. Logos: Ensemble, on fait avancer le Québec; Office des personnes handicapées du Québec. You are involved in group sports? Include children with disabilities in your group and help them develop their full potential at their own pace. You volunteer for cultural, sports or recreational organizations? Suggest that people in charge of activities or coaching receive specific training in welcoming and serving people with disabilities. You are part of an event organization committee? Favour obstacle-free inclusive activities. When required, install an access ramp, put up adequate signage, take security measures, etc. You provide direct services to the public? Should a person with a disability come to you accompanied by an assistant or someone serving as an interpreter, you must always speak directly to the person. Leaflet representing Philippe who has a visual disability. The poster shows Philippe in a social participation situation. He is shown standing up in front of a chair and lamp. His shadow on the floor represents a person using a cane. Philippe helps people grow. Because his university accommodated him and his employer recognized his skills, Philippe, who has a visual impairment, has been working as a psychologist for five years now. Together, let's build a more inclusive society. Semaine québécoise des personnes handicapées. June 1 to 7. Logos: Ensemble, on fait avancer le Québec; Office des personnes handicapées du Québec. You eat at the restaurant? You run a website? Make sure everything you put online is accessible to people with disabilities, especially those with visual impairments (consult the Quebec government Web Accessibility Standards ). You are a graphic artist? Use contrasting colours or eloquent pictograms on your posters and other visual identification items destined to the general public. Leaflet representing Samuel who has an autism spectrum disorder. On this poster we see Samuel in a situation of social participation. He's waiting at a bus stop with Tobi, his service (assistance) dog from MIRA Foundation. Fully engaged in society. The transit company in Samuel’s municipality saw that Samuel’s service dog, Tobi, was indispensable. As a result, Samuel, who has an autism spectrum disorder, has learned to control his anxiety when he travels from place to place, has developed his independence, and is now involved in his community. Together, let's build a more inclusive society. June 1 to 7. Semaine québécoise des personnes handicapées. 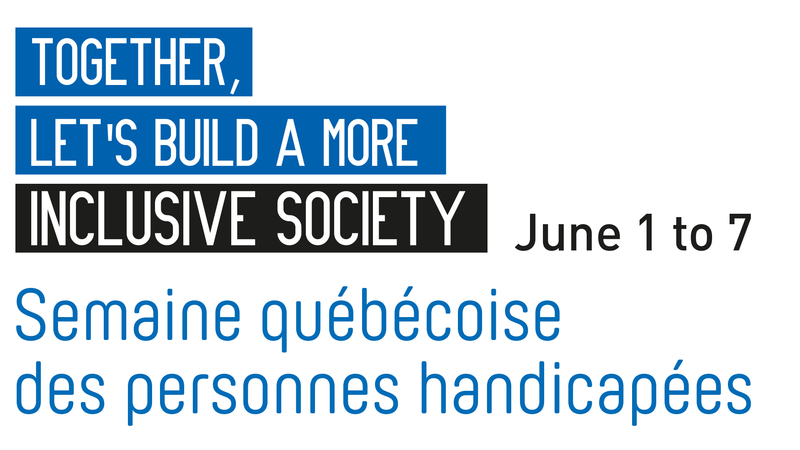 Logos at the bottom of the poster: Ensemble, on fait avancer le Québec; Office des personnes handicapées du Québec. Are you a teacher who has a child with an autism spectrum disorder (ASD) in your class? With the parents’ permission, explain this disorder to the students, or ask the student if he wants to do so. Do you work in customer services? Learn to recognize the signs of ASD so you can provide adapted services to ASD clients (see the Web Services accessible site for more information). Do you work in customer services? Avoid talking down to people with ASDs. Do you work in customer services? Be precise, clear and concise in your questions and requests. Are you a municipal emergency service employee? Suggest that your boss look into employee training in interventions involving people with ASDs. Are you a public transit bus driver? Make sure that travellers know which stop they are at through visual and auditory cues.